No one has time to dig through scores of threads to find that one message or file they need to get on with their work. 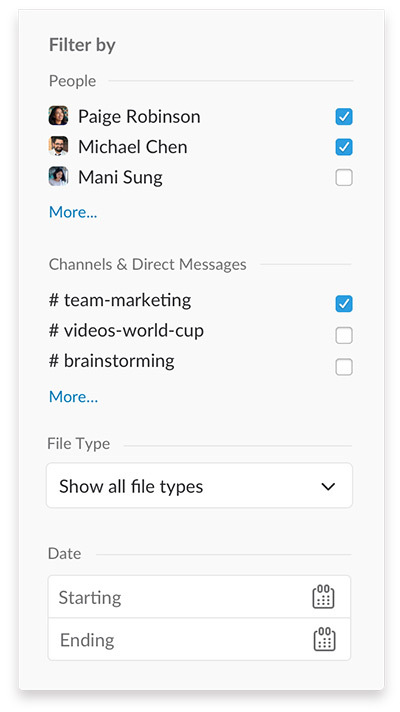 So, as of today, you can find information in Slack faster — whether it’s a message from a particular person or a specific file posted to a channel — thanks to the addition of new, simple search filters. We’ve also worked some magic to bring you smarter and more personalized search results based on the people you communicate with most often, the files that may be relevant to you, the channels you tend to participate in, and more. And all of that comes with a nifty expanded search view that makes sifting through results, and finding what you need, much more efficient. Let’s say you’re looking for a file related to the World Cup advertising campaign that your team has been planning. 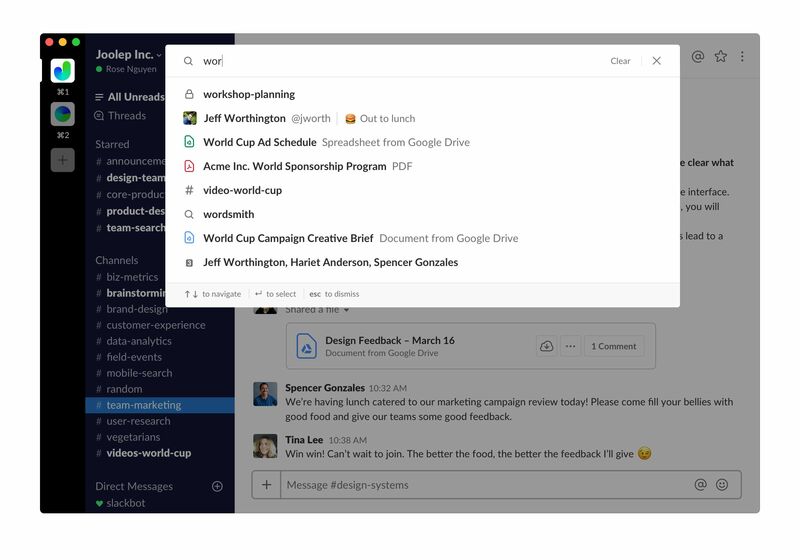 Start typing in the search bar in the upper right-hand corner and you’ll instantly be met with a helpful list of suggested results based on how, and with whom, you work in Slack. If you don’t find what you’re looking for right away, just press enter to see more results in an expanded view. There, you’ll have options to refine your search — by file types, categories like messages or files, and additional filters like people, channels, and direct messages — so you can locate the exact piece of content you need. Your suggested filters will even differ depending on your search query, since they’re tailored to your particular search terms and generally to how you work in Slack. You can choose from the filters already provided or add your own by clicking “more” under each section.